Another beautiful clean night in Flagstaff, Arizona. The sky was slightly less dark than the night before, but seeing was much steadier. This HDR composite shows Saturn and its moons Titan, Dione, Tethys, and Rhea. 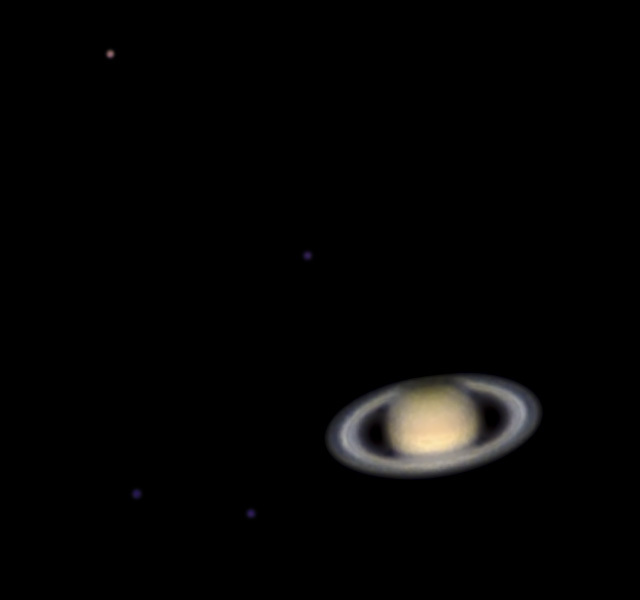 Sadly, Enseladus was too close to Saturn and lost in its glare in the 585 msec long exposure used for the moons. Saturn and four moons taken with a Questar 3.5" telescope, Dakin 2X Barlow lens, and ZWO ASI120MC camera on 2017-05-24 09:25UT. A HDR stack of the best 200 of 2000 images of Saturn (exposed 140 msec at gain 72) and 64 images of the moons (exposed 585 msec at gain 72). Stacked in AutoStakkert!2 with a 1.5x drizzle. Deconvolved in Lynkeos, noise reduction in Nebulosity, and final crop, HDR composite, and exposure adjustments in Photoshop.